In a medium sized pot, combine warabi starch and 3 cups water. Stir together well. You should get a white liquid. Turn the heat on high, and keep stirring until the mixture turns translucent throughout, resembling a gel. Take off heat, and pour the gel into a baking dish, cover, and chill in the refrigerator for a few hours until set. Combine brown sugar and water in a saucepan. Turn up heat and boil the mixture until syrupy. You know how to make syrup, right? 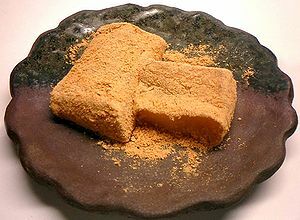 When set, cut the warabimochi in the dish into squares and remove. Coat in brown sugar syrup, and roll around in the kinako. So how did they taste? Well, I didn't hate them, but I didn't love them. The warabimochi itself is tasteless, though I did sort of detect a faint woodsy-earthy...brackeny aftertaste. You mostly taste the kinako, which is toasty and vaguely peanutbuttery, and the sweet syrup. The texture, however, can best be described as smooth and wobbly. You may not like it if you're not into jelly-like textures. But, I'm glad to say I've tried it.